For your caffeine needs, Starbucks always has your back, but grabbing a Starbucks or two doesn’t always mean the same thing. This infographic posted by Graeme Tomlinson, known on Instagram by his 109K followers as thefitnesschef_, is an eye-opening visual to bring awareness to the calorie counts of your coffee order. You could blissfully be sipping down an Iced White Chocolate Mocha in the morning and a Cinnamon Roll Frappuccino in the afternoon and never realize that it’s adding almost 800 calories to your daily total! It’s good to be aware of your liquid calories, because they go down so quickly and don’t keep you as satisfied since they don’t offer tons of protein or fiber. Graeme adds, “7-10 vanilla [lattes] per week equates to 1750-2500 calories. 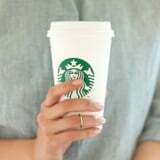 25 [Americanos] per week equates to 0 calories . . .” If fat loss is your goal, it may help to modify your Starbucks order. Don’t want to give up your fave drink? Just order a smaller size. Order “light” or “skinny” versions of your favorite drinks. Ask for fewer pumps of the syrup used in specialty drinks. Go for almond or nonfat milk over whole or soy milk. If you’re a tea drinker, choose unsweetened. Order these Starbucks drinks that are under 150 calories or these under 200. Choose one day a week to order your favorite dessert-like coffee and sit down to sip it (away from your computer screen) so you can thoroughly enjoy your treat.